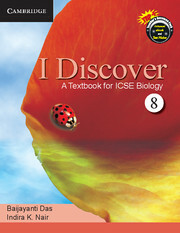 I Discover is a Textbook for ICSE Biology is a series of three books for classes 6 to 8 based on the latest syllabus of the Inter-State board for Anglo-Indian Education. 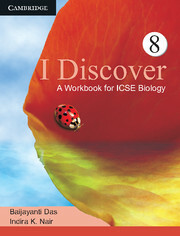 Each book leads students into the fun-filled world of biology in a well-graded manner. Scientific concepts are explained thoroughly. The book also helps in developing the thinking skills of students. 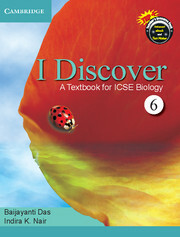 The activities in the books encourage students to discover and explore science in a joyful manner. Each book of the series contains a Teacher’s Manual which serve as an aid to teachers to organize and present the concepts effortlessly. A list of key objectives at the beginning of each chapter to give an overview. Key definition and Key point highlighted for easy access. In-text questions given as Checkpoint to help students check their learning progress. Key ideas at the end of each chapter for quick recapitulation. Key words to understand the meaning of new and difficult scientific terms in the chapter. Questions on Higher Order Thinking Skills (HOTS) to reinforce learning. Brain teaser to make learning an enjoyable experience. Know your science or scientist to engage and motivate learners. Project idea to encourage practical learning.